Thread: [ANN][ICO] Deskchain - A classified platform for buyers and sellers! Imagine life a few decades back! You would require to almost spending your whole day for making a very low amount of money spending your whole day away from your family and yet hardly able to bring a smile to their faces! The change started some time ago with the rise in Internet popularity. And then, it reached towards online platforms for buyers/sellers, which opened an entire NEW route of earning. That started the time when people finally were able to earn much more than what they desired and to do it sitting in front of their love and dear ones! But as with every story, here too villains were present. With problems and obstacles coming in to reduce the newly gained happiness in form of sites taking a significant chunk of the effort for no reason! 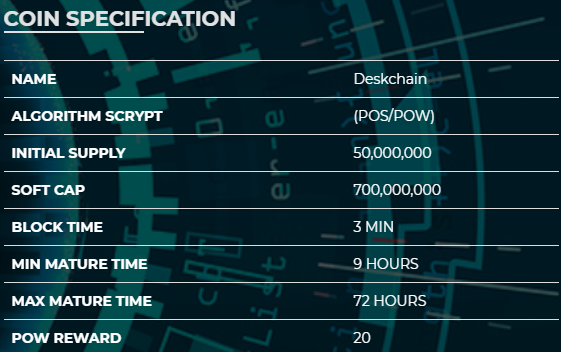 Taking all that up for years, finally the day has arrived where problems will decrease and happiness will increase with the thing called “Deskchain”. Deskchain is a name that’s here to bring back your smile and happiness, it is a classified platform created to help buyers and sellers all over the globe. It is not a RARE creation, but it comes with a RARE concept and structure, where YOU are the MOST IMPORTANT aspect! With not denting you by taking major chuck away. Here you will be in control of just about EVERYTHING. Deskchain is a platform, which will enable creators to sell their digital products directly to consumers without the interference of middlemen. It will allow all type of creators from Authors, comedians, designers, filmmakers, musicians, and software developers to use Deskchain to sell their products DIRECTLY to consumers (buyers), mostly digital content like Albums, Comics, Ebooks, Films, Games, Music, or tutorials. 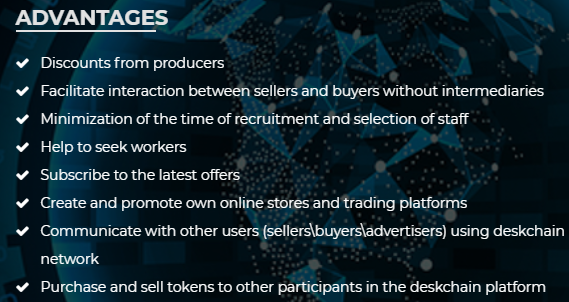 Deskchain allows to create and promote own online store with a single click, have email broadcast feature to attract more customers and much more. There is also complete safety, security, privacy and much more in place to add to the comfort and easiness to the people. But that’s not all! There will be Deskchain Mobile App available as well, which will allow EASY access to everyone from anywhere in the globe. With the Ecosystem, it will allow one to manage everything easily through their smartphones! Deskchain aims for much more in upcoming months with the roadmap already set in, there is a lot more in store for the users. The simplest aim to ensure every individual gets what he deserves! With perfect plans running into place, it only is going to help to take Deskchain to the global level that is aimed for! It is NEVER possible to get such scale of the project on without having a team to match the requirement. There is an exceptional team in place from experts of the blockchain technology to high quality advisors with proven track records and loads of experience behind. This is what makes Deskchain amongst the HOTTEST projects out there and it's our aim to continue on bringing more and more talented people to join us to further expand the project! So, now is the time to get yourself into something you are already IN, but this time with getting the kind of rewards you always wanted and deserved!